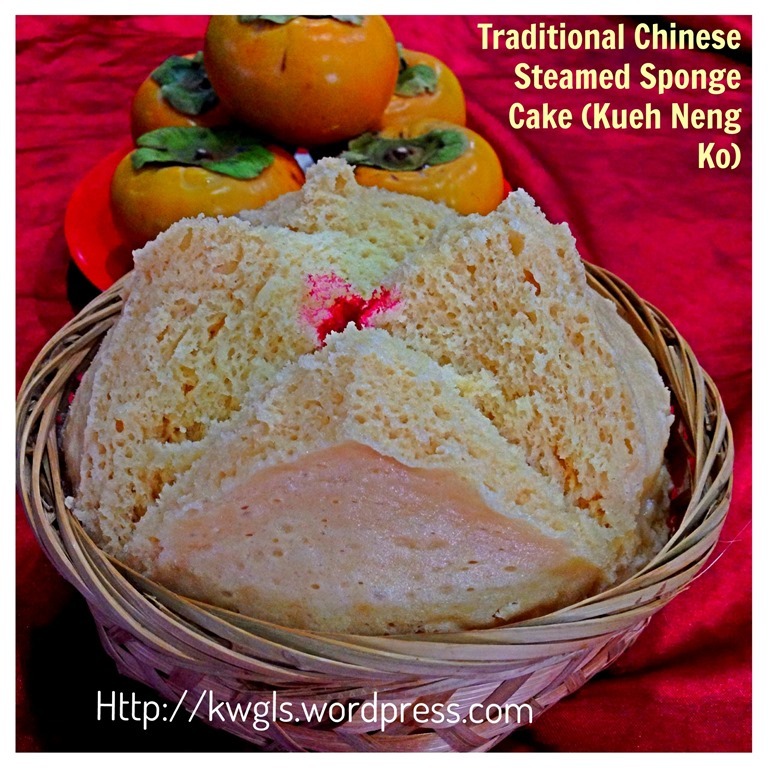 This is my third post of Kueh Neng Ko or Chinese Steamed Sponge Cake. 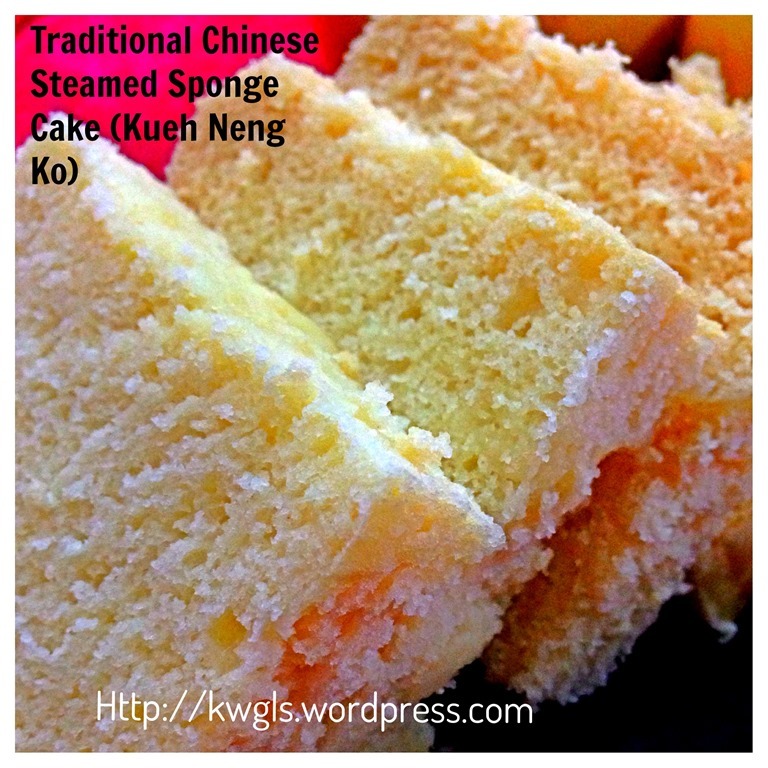 Chinese Steamed Sponge Cake and Sarawak Laksa had always been my two top posts since I set up this blog. 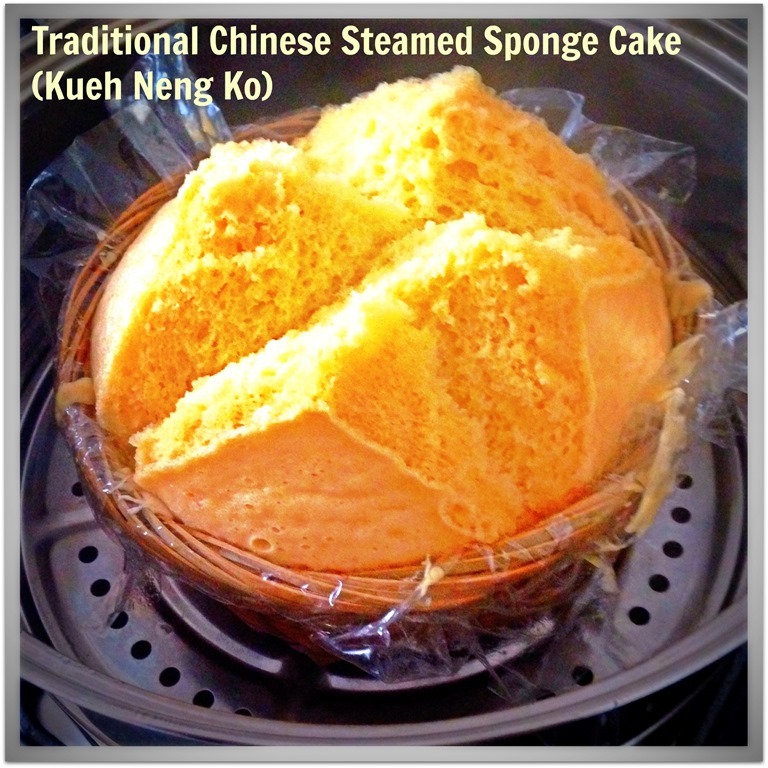 In fact, since I last posted my gassy steamed sponge cake on August 13, 2013, there were daily visits to the post until today. 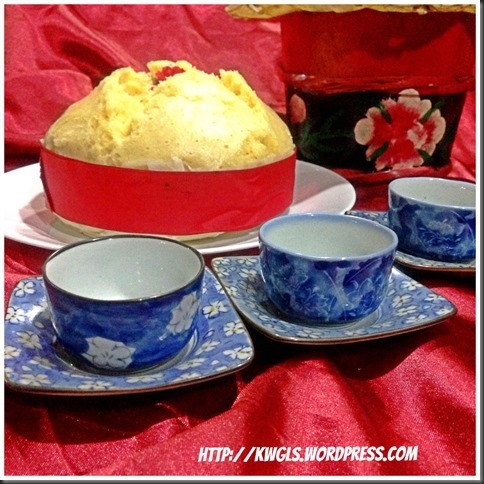 In fact some readers have tried the recipe many times and communicated with me about better ways to prepare a non surprise Chinese Steamed Sponge Cake. Essentially, this means that a sponge cake that will “smile” and not “bold headed”. 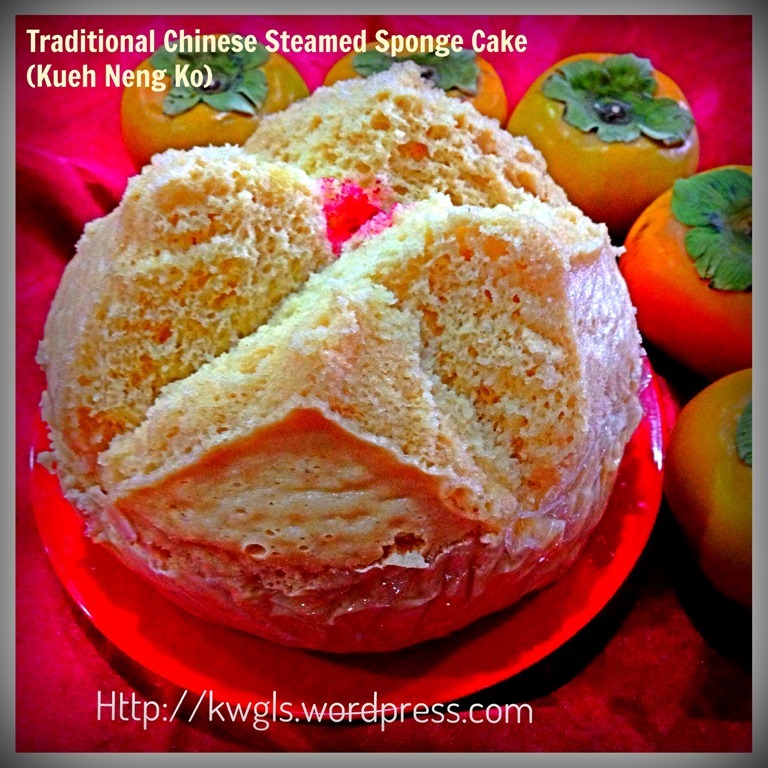 There are a lot of readers who are passionate about the preparation of this traditional steamed sponge cake. Asking most elderly bakers, they will tell you that this is a delicate cake and the outcome can be rather unpredictable as it depends on too many factors such as steamed temperature, how long the eggs have been beaten, type of steaming utensils and etc. .. In another words, elders has always regarded the cake as cakes that have lots of taboo/prohibitions during the preparation process. Therefore, preparing a smiling Kueh Neng Ko is my mission today and as a test to my earlier recipe. 2 days ago when I went shopping in a baking supply store, I was surprised to find the type of bamboo baskets that I have been looking for a while. 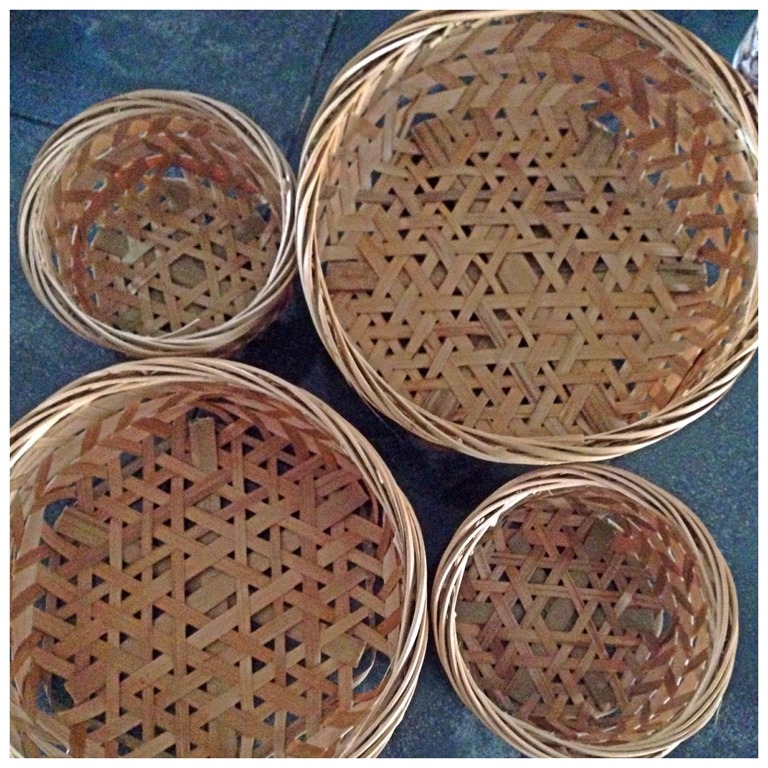 This is the type of bamboo baskets that my mum used to steam Huat Kueh (another type of steamed rice cake) years ago. In fact, I did not place any hope to find this in Singapore as I may have wrongly perceived that it is rather untrendy to use this type of traditional bamboo baskets nowadays. 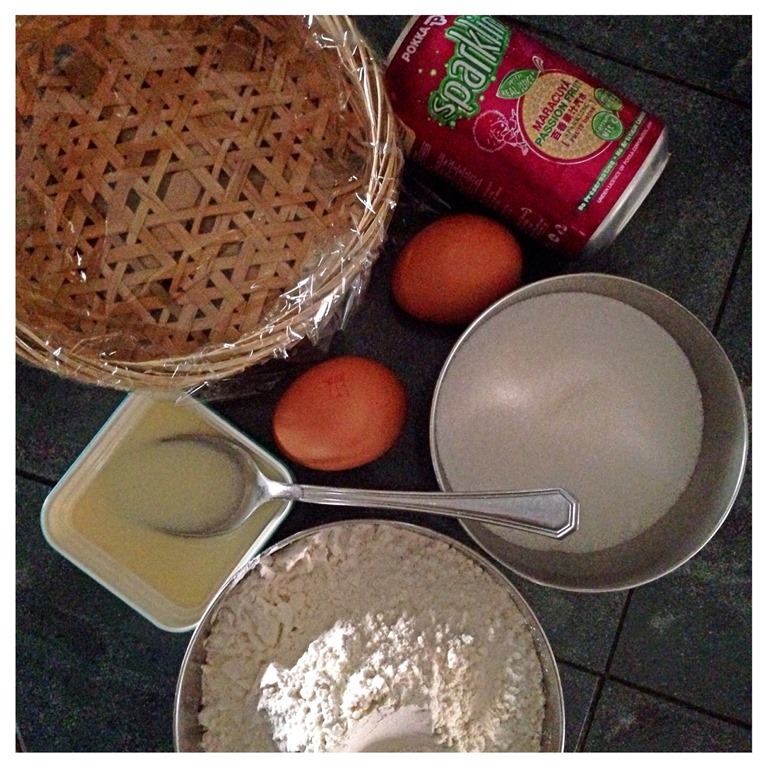 Immediately when I saw the baskets, I bought a few and eager to try preparing Kueh Neng Ko again. 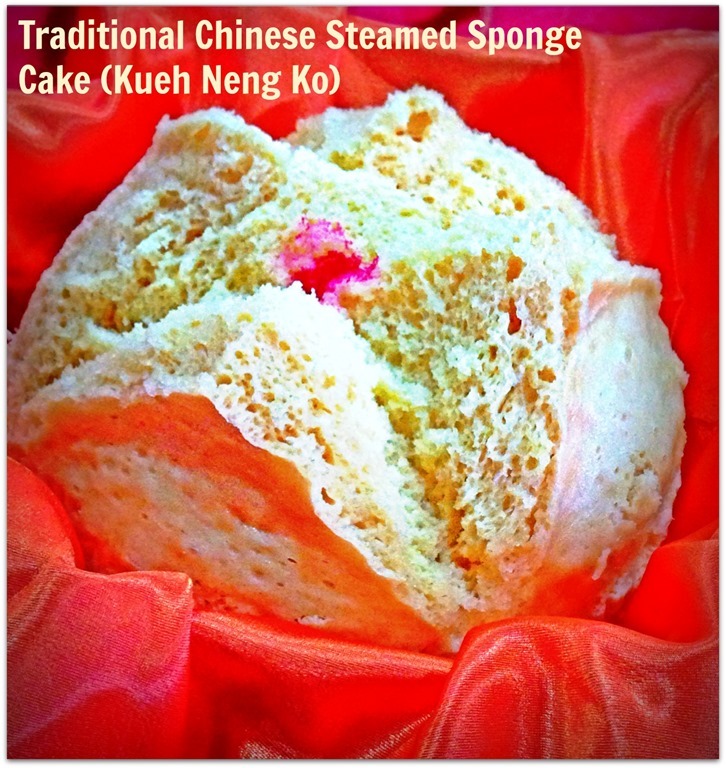 The mould wouldn’t disappoint me, it give a wide smiling Kueh Neng Ko using exactly the same old recipe. However, because I do not have 7-up or Sprite, I have used passion fruit/peach flavoured sparkling water and therefore, the Kueh Neng Ko became passion fruit/peach flavoured. By the same logic, readers will be able to prepare Kueh Neng Ko of your preferred flavour..from orange to cola to… anything that you like. For this illustration, I have used passion fruit/peach flavour sparkling water instead of the traditional 7 up or sprite. 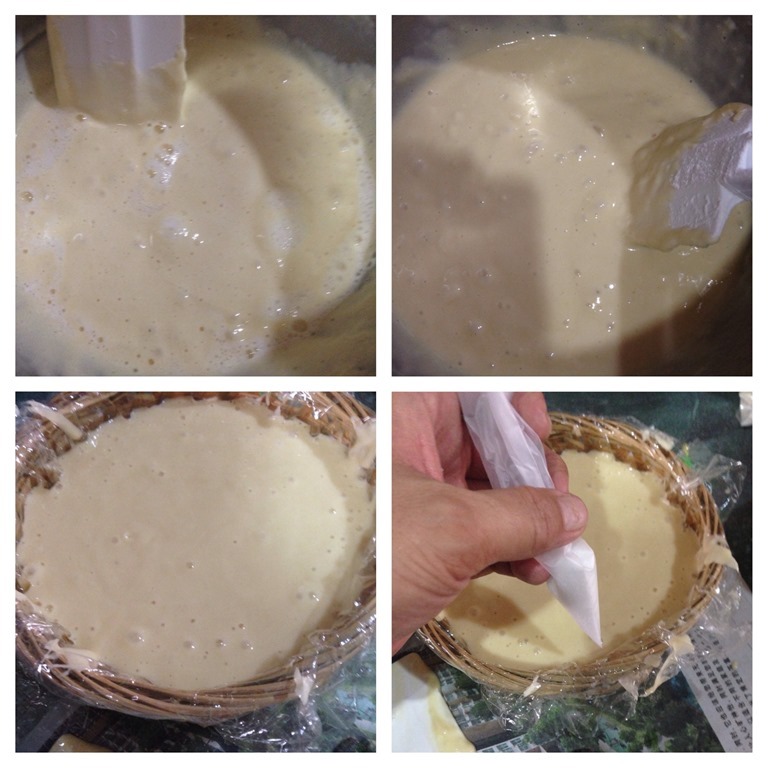 Get ready a 6 inches diameter bamboo basket/rattan casing and lined it with lined with cellophane plastic sheet (竹篮玻璃纸). Crack two eggs in a big mixing bowl. 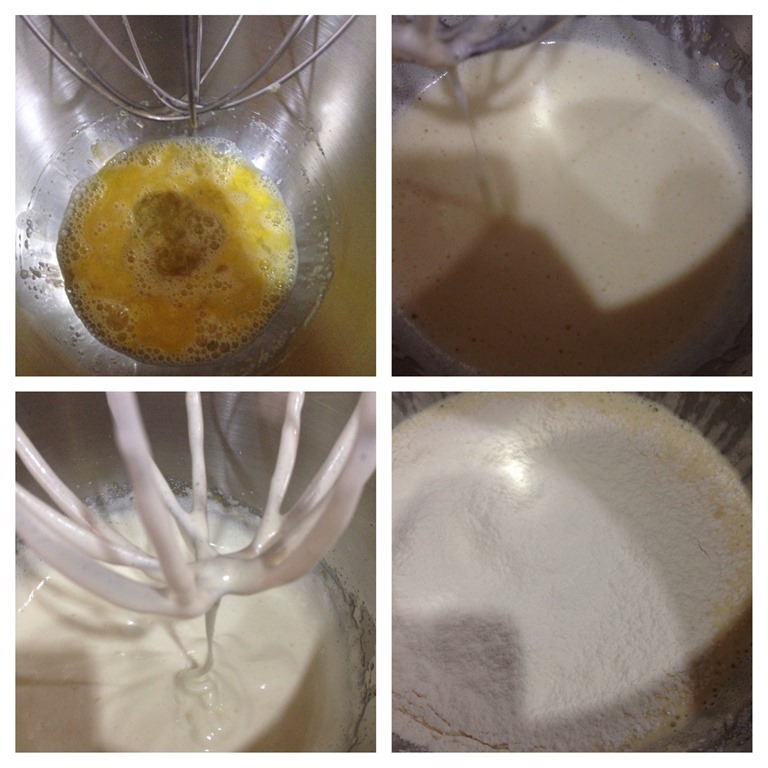 Add the sugar and 2 tablespoons of condensed milks, beat at high speed until the eggs turns light and fluffy. (Note that as a result of adding condensed milks, you may not be able to obtain the soft peak form from egg beating). Fold in the sifted flour as quickly as possible. Add in the gassy drinks and, stir lightly and quickly until well mixed. Steamed under high heat for about 25-30 minutes or until a skewer inserted in and comes out clean. Put in additional hot water if the water dries up. Do not open the steamer cover for the first 15 minutes. 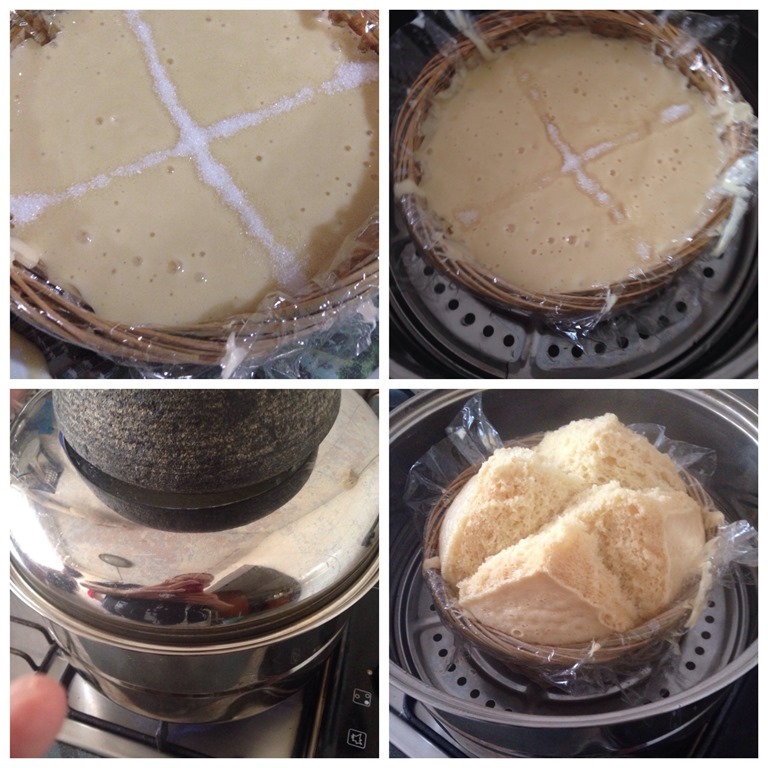 Once your remove the cake from the steamer, immediately remove it from the bamboo basket. Place in a wire rack and let it cool completely. 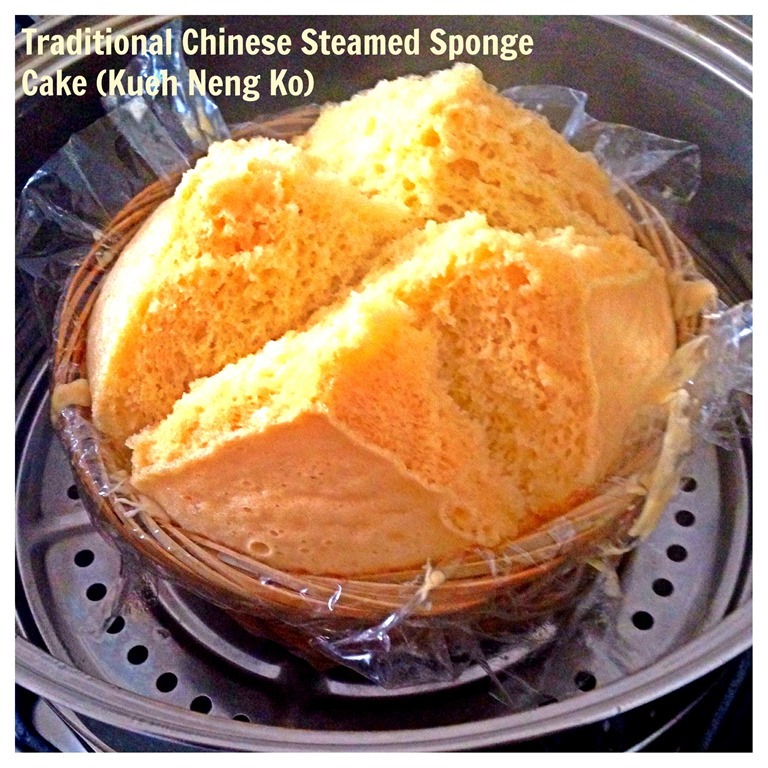 I am extremely happy this steamed sponge cake give me a big smiling face again. 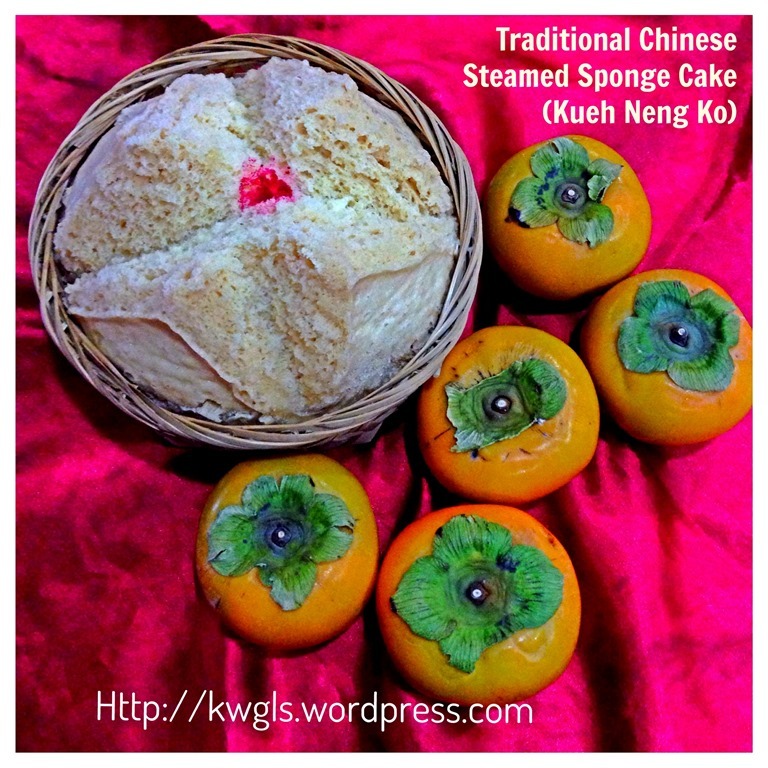 Since there are many type of gassy drinks or sparkling water available in the market, therefore you can easily adjust the traditional steamed sponge cake to the flavour that you like. This is the sparkling water of passion fruit/peach flavour, therefore, my resultant steamed sponge cake also become passion fruit/peach flavoured. Is it not good to have some changes? But the colour of the steamed sponge cake will depend on the colour of your sparkling water used. Hope you like the post today and happy trying. Have a nice day. 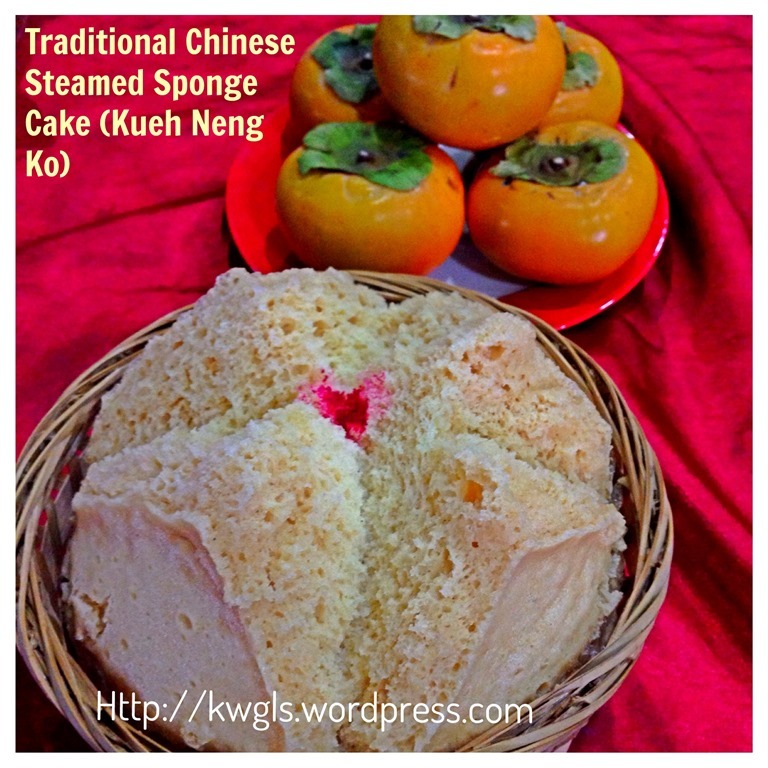 This entry was posted in Chinese and Asian Cakes and Snacks, Food Preparation Series and tagged 8, chicken egg cake, chinese steamed sponge cake, Guaishushu, kueh neng ko, peach flavoured kueh neng ko, postaday. Bookmark the permalink. Ahhhhhh!!!! So that’s how you get it to “crack” – looks like the other type of Chinese koi, white ones, now what do you call them now? Love eating those with melted butter… Yummm!!!! These looks absolutely wonderful. What a clever technique. I would be so proud to have made this. Definitely going to try it. Where did you buy the bamboo baskets in Singapore? I can’t find it anywhere.